Applications are invited for admission in 1st Year. Last date for submission of application is 30th April, 2019. Admission will be awarded on open merit basis. 1. Selection of candidates from all provinces of Pakistan will be made on open merit basis. 2. Admission will be granted on the basis of intelligence test, written test, interview and medical examination. 3. 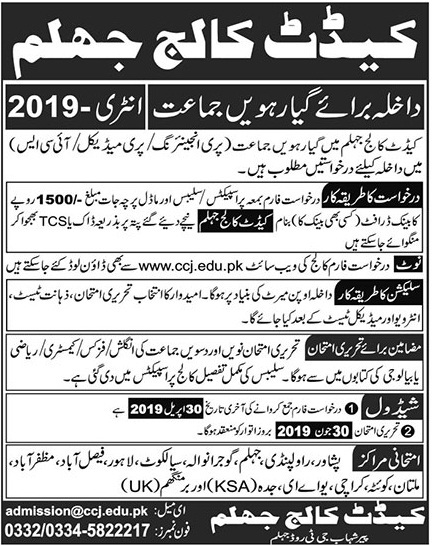 Written test/interview will be held on 30th June, 2019 (Sunday) at Cadet College Jhelum. Click here to download the syllabus for 1st year. Prospectus along with application form, model papers and syllabus can be obtained by sending a bank draft(any bank) of Rs. 1500 in the name of “Cadet College Jhelum” on the address below.